In case you missed it, about a month ago, CUDA decided to close Café Connection. Those of us who have been with it since birth are sad to let go. It was a fun venture and we had high hopes for it as a sustainable source of income for the NGO, but in reality it fell short. It simply required too much investment of time and resources without generating consistent profit. We chose not to renew our lease of the space and found another location to house our offices and language school, with new ideas for ways to use it to generate income. It will house a snack area for workers and language students, so we have one cafe employee making the move with us and we'll still offer bagged coffee and to-go drinks and snacks. We'll miss the sillar walls and familiar feel of this place that has served as a hub for the last couple of years, but it's the right time to reconsider our best approach. There is no change with coffee sales in the States, so be sure to check out Luminous Coffee and figure out which of our varieties is your favorite. We have a new project in the works here in Arequipa. As some of you know we have a new team of missionary families joining Team Arequipa in the field beginning in January. One great asset the new families bring is medical knowledge. Four of the eight adults are medical professionals so we decided to capitalize on that incoming expertise and come up with a way that CUDA can help communities be healthier. To that end Alfredo has spent the past few months planning our 2014 health initiative and we are in the final stages of having it approved by the local and regional governments. We’ll report in detail on the program later but I’d like to ask you all to begin praying for our collaboration with the health-network in the district of Hunter. The doctors and administrators in charge of the network there have been very supportive and quite excited about the potential possibilities our partnership will provide. We are equally excited to begin working in Hunter and hope you’ll remember the program in your prayers. In other news our first shipment of coffee has made it to Lima and soon embarks on its maiden voyage to Texas. As soon as possible we will be shipping fresh-roasted gourmet coffee right to your door. Though we tried our best the coffee won’t arrive in time for Christmas delivery. If you want to give the gift of CUDA coffee we plan on selling a gift certificate redeemable for individual bags or subscriptions. Once all the details are finalized we’ll send out the word via email, FB and Twitter so you can be guaranteed delivery from our first roasting session. For years you’ve bought every pound of coffee we could bring back with us and we hope you’ll support this new enterprise. 16 huge bags (151 pounds each!) of coffee in a Lima warehouse. Recently a new couple joined us in Arequipa for a two year stint as “apprentices.” Bethany and Andrew Gray come to us from Australia (east cost, Brisbane) after being connected via Gary Green from ACU. They are excited to work with our development programs, especially the new health initiative being planned, and to get to know the Peruvians in our church network and minister alongside them. First things first though, they’ve begun intensive language learning at our language school. Twenty hours of Spanish classes each week take a toll on you mentally, emotionally and physically. Will you pray for them to have the stamina and dedication to their studies? Advancing as much as possible in their language classes now will help set them up for a good two years of ministry here in Arequipa. We are this close (imagine my hands held up really close together. . .) to being able to deliver fresh-roasted CUDA coffee stateside door! Once the international leg is worked out, a literal ton of CUDA coffee will head that way, with two new varieties in addition to our standard Tunki. After it arrives in Texas, we will start fresh-roasting and shipping orders around the end of November in time for Christmas. In a few weeks, we’ll send out emails with details on the coffee we have to offer as well as some gift combos that should make great Christmas gifts. Thanks for your support of CUDA in this new venture. We hope it will contribute toward sustainability for the NGO in years to come. With 2013 drawing to a close we are getting ready for our new teammates to arrive in Arequipa. Four families (the Frouds, Morgans, Blairs and Daggetts) will begin arriving in January with the last family set to arrive around August. Recently we have been celebrating with the Morgans and Frouds as they have finalized their support with two different churches. The Frouds will be supported by the Cloverdale church in Searcy while the Morgans will partner with the Pleasant Valley church in Little Rock. As the Frouds and Morgans enter into their final 3-4 months before the move be praying for them. It is a hectic time full of change and goodbyes. Pray for their last few months spent with supporting churches; that strong relationships would be formed and solid support structures put into place. Pray for their last goodbyes to family members and for their arrival (Frouds in January, Morgans in February) in Arequipa. We are ready for them to be here! When we decided to open a coffee shop we did our research on what coffees were available to us in Peru. Right away we weeded out anything that wasn’t certified fair-trade and organic and from there we began testing for the best tasting coffee. Well it didn’t take long to pick the winner. Tunki coffee, produced by a small producer co-op near Puno, has been an international award winner (1st place in 2010) and maintains high quality taste year over year. For almost two years now we have been purchasing Tunki coffee through for use in our cafe and for sales in the US. While we have wanted to take a trip to the valley to visit the coffee plantations and operations an opportunity just hadn’t arisen; until this month. Greg, Alfredo and I were able to arrange a trip to visit the main coffee factory in Juliaca and then travel on to Sandia (the valley) to visit one of the co-op’s headquarters and to visit with some of the owners of the hillside coffee plantations. The journey was an interesting combination of excellent and harrowing. The harrowing part was the travel out to the valley from Juliaca. Sadly I don’t have pictures to do the description justice but just imagine yourself in 15 passenger van going downhill around sheer mountain cliffs on a one lane road while needing to pass cars or make room for cars coming up the hill. On top of that there were hairpin turns aplenty and a driver who loved to drive at breakneck speeds. We were all very thankful to arrive in the valley safely. We stayed in the small town of Massiapo where the Inambari coffee co-op is located. One of the members of this co-op submitted a sample to the SCAA (Specialty Coffee Association of America) this year and was ranked 3rd best in the world. The co-op president took us out to visit two different plantations about an hour outside of town, high up on the side of the mountains (about 1800 meters up). Though we arrived post harvest we were able to see quite a lot. Plants still laden with beans, beans laid out for drying, a newly developed area with recently planted coffee plants, and more. Back in Massiapo that afternoon we were treated to a cupping seminar by the co-op’s resident coffee specialist, Rigoberto (a licensed Q grader). He prepared five different coffee samples for testing. He talked us through how to officially cup (test) the coffee and how to officially score using international scoring guidelines. The lesson was very interesting and Greg especially enjoyed himself as he graded the coffee samples with Rigoberto. We were so grateful to CECOVASA (the parent organization of the various co-ops) for hosting us at their factory and for arranging our guides in the valley. As we prepare to ramp up sales of CUDA coffee through exporting to the US we felt it necessary to gain a deeper understanding of the coffee we sell. This trip was an eye-opener and has given us a lot of ideas for our business going forward. Enjoy the pictures! So far 2013 has been a very important year for CUDA. It has been year of ups and downs, a year of consolidation, adjustment, innovation and vision-casting. The year has also had its fair share of uncertainty, scrambling for solution, going-back-to-the-drawing-board, and prayerful seeking for guidance. I guess, when I put it that way, it’s been like most years in our NGO’s short history. However this year has seen some very special things happen. Things whose ramifications will be felt (and appreciated) for years to come. First, we’ve reached a milestone in our bid for validation from the Peruvian government. We have received authorization from Peru to operate as an NGO offering technical expertise in development programs. CUDA now has its own business ID number, can officially formalize contracts and other documents with government and business entities, and can obtain visas for volunteers and workers, among other things. This was one of our primary goals for the year and it feels good to have all of this finally taken care of, though it in no way means we are done dealing with the government. Then, once the government officially recognized us as a foreign NGO operating in Peru we had to begin the process of having our projects officially approved. To do this required a partnership with a local organization, government or otherwise, to execute the program. You may have seen the update on our Facebook page but a few months ago we signed an agreement with the regional Ministry of Education validating the Living Library program, giving us official government backing and support. Having this project approved means we can also begin to request visas for our volunteers and project collaborators instead of having to use other organizations to acquire our visas. In regard to the vision of the organization, the potential for growth in the library program has spurred us into finalizing our NGO’s 5-year plan both for itself as an organization and for each project specifically. Forming these plans is beneficial not just from a strategy standpoint but from a fundraising standpoint also. For example, once planning/dreaming began for the library it soon became evident that the program had vast potential for growth and a need for formal funding. To that end we have begun to send letters to grant-makers detailing the program and its needs. Be in prayer for this process as we would like to push for significant growth in the program in 2014 but need the funding to come through to make it happen. One last new development to share with you this month is that plans are in motion now to begin sending CUDA Coffee to the US in larger quantities with the goal of establishing consistent, substantial monthly sales. We know that many of you have purchased a bag or two when we’ve managed to bring it back with us and appreciate your collaboration. With greater availability we think many of you, and others, will decide to make CUDA Coffee your regular in-house coffee. As always all profits go to the NGO and its work in Arequipa. We hope to be selling coffee full-time by December. We are continually grateful for you, our stateside supporters. We depend on your FB Likes, your Twitter retweets, supportive comments while on furlough, micro-loans made, books donated, monthly and random donations, and prayer. Put plainly we wouldn’t be here now with you. Thanks for being there for us now and for making us confident of our ability to continue our work into the future. 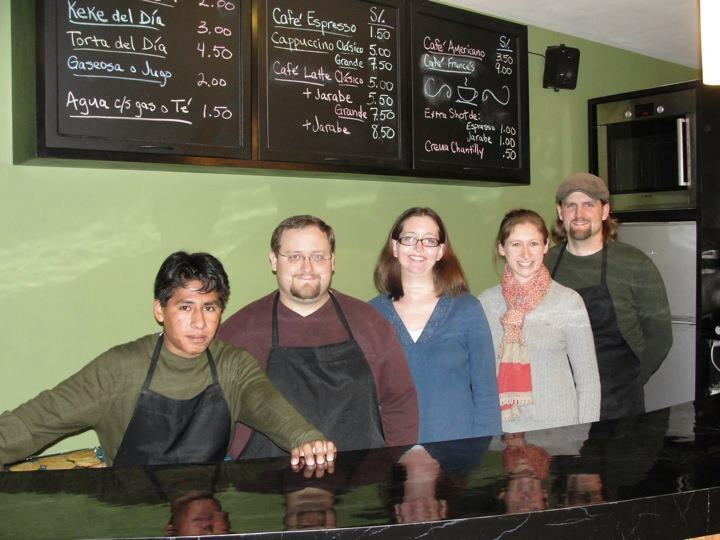 In late 2011, we asked for help in funding a new facet of our work here in Arequipa, Café Connection. Thanks to your help we were able to obtain a building for not just the cafe but that would also serve CUDA in a variety of ways. We opened the cafe in February of last year in what we thought would be its home for a long time, but plans often change unexpectedly here and this was no exception. 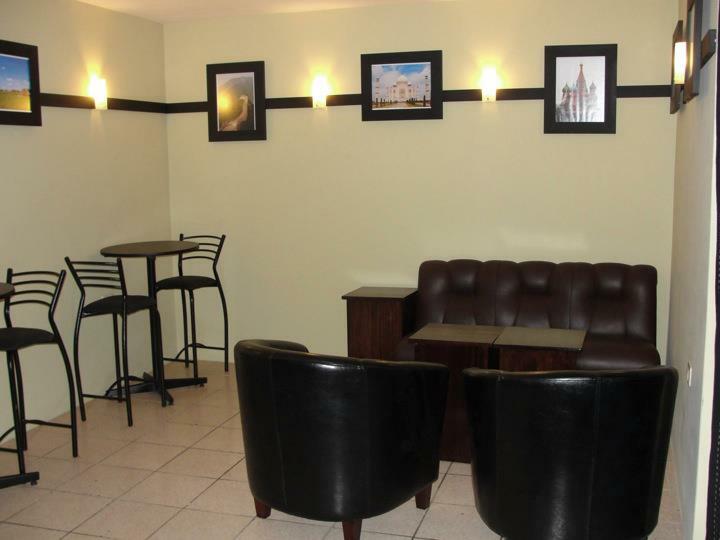 Due to problems with the building’s ownership, we were forced to look for a new place, resulting in our current location in downtown Arequipa. Strategically, this location is far superior and we feel blessed to have found it, and to have gotten such a good deal from the owner. After only three months of regular operation in the new location, we are seeing more clients and higher sales than we had begun to have at the previous location. This is important because we didn’t open the cafe just to have a place to hang out, nor to drink delicious coffee. We opened this business to begin generating income for the organization as part of a long-term strategy of sustainability, and to open new avenues for spreading news of our social justice projects in Arequipa. It is quite rewarding to see how far the cafe has come after a year in operation, especially considering that four months ago we changed location. Already the cafe is nearing self-sustainability and with the added traffic of being downtown, the cafe workers are having lots of opportunities to share about CUDA projects. Just today, a couple from Florida, who had visited the cafe yesterday and learned about us, dropped off books for the library program. They had brought books with them to donate to a voluntourism agency, but after learning about our work yesterday decided to leave them with us. We’ve made contact with other NGOs, tourist agencies, and businesses with whom we might partner, all thanks to the cafe. The cafe has also served as a place for our churches to host events such as women’s meetings, parenting seminars and college student gatherings. So a big thank you to all of you who have prayed for Cafe Connection to be a success both financially and ministerially. Keep praying! Soon we’ll officially launch a language school, our next step toward keeping CUDA as self-sustaining as possible. You can stay in the know by following CUDA and Cafe Connection on FB or Twitter. Another month, another update. There's been some big news that you may not have heard so get ready. Before I do I'd like to remind you all to pray for the safe travels of Greg and Megan (their kids too). They get back to Arequipa on the 28th and its fair to say that the work has missed them. I'll start with Cafe Connection. After eight months of being open we were faced with an emergency situation. For months, we had been receiving notices from various banks and stores concerning the outstanding debt the owner of the building had accumulated. Well, at the end of September, a letter came threatening repossession of the building but, more important, it advised us that a bank had received authorization from the courts to enter the building by force and remove the possessions therein. This was understandably a serious concern, so we began to look for a new location in case the situation worsened and the cafe’s belongings were seized. One week into our search, Alfredo happened across an option downtown and after two or three visits we decided to sign the lease. We really like the new location and think it has a lot of potential. It is downtown, one block off of the main square in an old-style sillar building. We hope to reopen by the first of November, though this is still Peru, so we will see. The micro-loan program is rolling along nicely. Paty is now in charge of more weekly group meetings than I am and she is running them better than I ever could. We are currently at the interviewing stage with one new group and a good number of loans are still available on the website with four more to be added soon (so go check it out (cudaperu.org/loans)! One new development in the micro-loan program is the addition of a new type of loan aimed at low-income homeowners in newly founded, under-developed communities. We hope to offer home-improvement loans at very low (or no!) interest for construction costs on their homes. I plan on posting more about this, including our reasons for offering these loans, but I hope you'll prayerfully consider helping these new borrowers improve their homes. More info coming soon! As you may have read the public school teachers of Peru went on strike shortly before the McKinzies left for their furlough. About two weeks ago the strike slowly began to lift and Neil Cantrall, who was left in charge of the program, has began to get back to work in the schools. While he has not had a lot of opportunities to be with the kids this month he has had a lot of time to prepare, and to work with the volunteers of Put Them First, the NGO we partner with at one of the schools. Pray for the kids at the schools we partner with. They missed two months of school and must make up that time in order to move on to the next grade. As the school year winds down Megan will begin to meet with Neil and the other library workers to develop strategy and plan for next year. It should be an exciting one and we'll have a lot of things to announce before the year is out. Well that seems to be all the big news to share for now, with more to come soon as there are some very exciting things in the works. Keep praying for the Peruvians we are trying to help, the CUDA staff and volunteers, and our stateside partners who help make this possible. We are grateful for all of you and your continued, prayerful, support. Café Connection is (finally) open for business! After delays by the carpenter, electrician, plumber, painter and the rain we were able to open our doors on Feb 17. A few days later we invited friends and contacts to the cafe so they could see the place and try the different drinks and baked goods. We are very excited about the opportunities this new business presents us with. Not only do all profits go towards expanding our development work but we now have a solid base of operations for reaching out to the college students just down the road. We are confident that God will use this location and ask that you pray that He do just that. Here are some pictures so you can get to know the place, that is until you are able to come in person.